ویلیام رِنکویست (انگلیسی: William Rehnquist; ۱ اکتبر ۱۹۲۴ – ۳ سپتامبر ۲۰۰۵(۲۰۰۵-09-0۳)) سیاست‌مدار اهل ایالات متحده آمریکا بود. ↑ "Members of the Supreme Court of the United States". Supreme Court of the United States. Retrieved ۱۱ آوریل ۲۰۱۰. The date a Member of the Court took his/her Judicial oath (the Judiciary Act provided "That the Justices of the Supreme Court, and the district judges, before they proceed to execute the duties of their respective offices, shall take the following oath . . . ") is here used as the date of the beginning of his/her service, for until that oath is taken he/she is not vested with the prerogatives of the office. ↑ ELCA News Service (September 6, 2005). 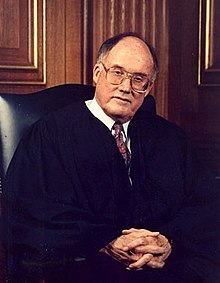 "U.S. Chief Justice William H. Rehnquist, Prominent Lutheran, Dies". Evangelical Lutheran Church in America. Retrieved 2013-02-14. مشارکت‌کنندگان ویکی‌پدیا. «William Rehnquist». در دانشنامهٔ ویکی‌پدیای انگلیسی، بازبینی‌شده در ۱۳ دسامبر ۲۰۱۵. «William_Rehnquist». بازبینی‌شده در ۱۳ دسامبر ۲۰۱۵. در ویکی‌انبار پرونده‌هایی دربارهٔ ویلیام رنکویست موجود است. این صفحه آخرین‌بار در ‏۴ فوریهٔ ۲۰۱۹ ساعت ‏۰۷:۰۴ ویرایش شده‌است.